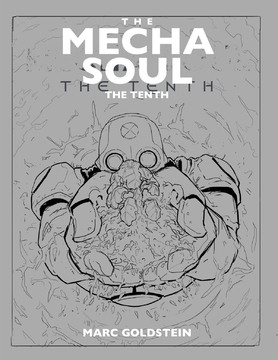 It took me so long to write the first two volumes of my space-opera trilogy, The Mecha-Soul, that when the time came to create a cover in order to present volume I to potential editors, I was lost. It’s only during the last couple of weeks that I realized I was totally unprepared for such a task. In the past, I had designed most of my film and projects covers, but I just did it without thinking it really through. But when there’s so much to say, to show, what do you put on the cover? The good guys, obviously, the bad guys, maybe, the symbols like a sword, possibly, the space ships, why not? And how can that cover evolve for volume II and III? What are the colors, what feeling do I want to convey, who am I talking to? So many characters, so many planets, so many people, so many creatures… I was completely lost! It all came down to one single question: What do I want to say? What’s important to me? What feeling do I want to convey? Then, why this title? 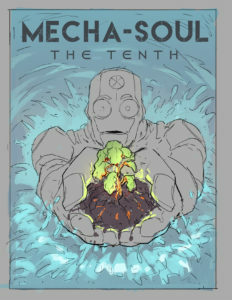 What’s so important to me in this title, The Mecha-Soul? To begin with, I sent all the visuals I could lay me hands on to the infographist. I explained him everything. However, I was foolish to believe that he would be able to pick in all that material, the elements that could convey my view, my desire, my intention. It would be my job that, and nobody else’s! To that, I added the sea, cradle of life in general and of this story in particular. In the featured sketch, the colors are just there to separate the different elements. However, a lot remains to be done in the preliminary sketching work. I think I’ll go back to an earlier version, where you couldn’t see the robot mouth and where the robot is much higher in the air. Then there’ll be the question of his colors. I already know that he’s red and white, but what red, and on which part of his body. And most important, his eyes, how will they be like? Plain lights, smoothed edges? What color for the eyes, yellow? This is without taking into account the title police. How are the letters going to be? Existing ones, or specially designed ones, like in Star Wars or in the Lord of the Rings? Just for the pleasure, watch the following clip by clicking on the link hereunder, where you’ll discover there drawing stages of preliminary sketch n°4 being carried out.